“After sinking to a low level at the end of 1929 and throwing something like three million men upon the streets, the industrial indices showed measurable signs of improvement. The stock market collected itself and began a new advance. Common stocks had not lost their lure; every speculator who had not been utterly cleaned out in the panic sought eagerly for the hair of the dog that bit him. During the first three months of 1930 a Little Bull Market gave a very plausible imitation of the Big Bull Market. Trading became as heavy as in the golden summer of 1929, and the prices of the leading stocks actually regained more than half the ground they had lost during the debacle. For a time it seemed as if perhaps the hopeful prophets at Washington were right and prosperity was coming once more and it would be well to get in on the ground floor and make up those dismal losses of 1929. But in April this brief illusion began to sicken and die. Business reaction had set in again. By the end of the sixty-day period set for recovery by the President and his Secretary of Commerce, commodity prices were going down, production indices were going down, the stock market was taking a series of painful tumbles, and hope deferred was making the American heart sick.” – Only Yesterday: An Informal History of the 1920’s. Fredrick Lewis Allen, 1931. As we stated in November 2009, Greece is “probably the closest to default.” Greece is currently unable to borrow from the credit markets. Without financing it is unable to support its banks; it is fighting for its own survival. We explained why this important in February 2010's report titled, Bernanke Fails His Own “Two Lessons Learned” from the Great Depression; “With European governments ‘crowding out’ private sector needs for capital and/or defaulting (causing massive losses at European banks), the risk is that a large European bank failure will generate another wave of financial crisis around the world such as happened in late 1930 and early 1931.” A mere two months later and this is precisely what we have: “Moody’s downgraded the debt and deposit ratings of nine Greek banks on Friday.“ This “downgrade affects all of the nation’s major lenders, as well as their smaller rivals.” It’s a national banking system downgrade sparked by the government’s own financing issues. But these problems extend beyond just Greece. “’It’s like Lehman Brothers and Bear Stearns,’ said Philip Lane, a professor of international economics at Trinity College in Ireland, referring to the Wall Street failures that propelled the financial crisis of 2008. 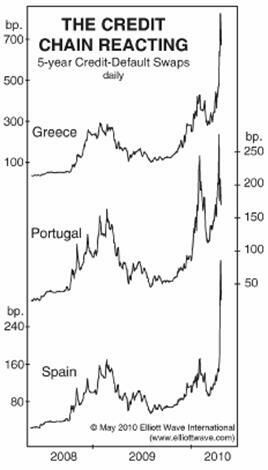 The subprime Greece (they were recently cut to junk status) contagion has already moved to Portugal and Spain. Remember when Bernanke said the subprime crisis was contained? After looking at the balance sheets of European banks back in February, we concluded: “it is Spain and Ireland that are even more important to European bank balance sheets.” Spain’s 20% unemployment rate is a disaster. We expect Spain to meet the same fate as Greece, causing massive bank failures throughout Europe. Look for the supranational institution, the International Monetary Fund (U.S. Taxpayer funded), to attempt to stem the tide. However according to Bank of America via Zerohedge, the IMF's total bailout capacity is only $700B. The total funding needed by Portugal, Ireland, Italy, Greece, and Spain is $2Trillion over the next 3 years. Ben Bernanke’s second great lesson learned from the Great Depression is becoming a reality. As we entered into the Crash of 2008, we addressed the possibility of a new trend in livestock. Most farmers were slaughtering and selling their cattle back in 2008. When everyone is selling, the trend is usually near its end. So it should be no surprise that as the Financial Times reports: “Livestock has been far and away the best performer in the S&P GSCI commodities index this year, its 16 per cent gain five times stronger than the increase of the broader spot index.” After the “biggest rally in fed cattle prices from December till April in the last 30 years,” prices are almost back up to 2008 levels. And while 2008 might have been a low, we suspect it is not the Depression low. Instead, we expect the severe deflation contagion to emanate from Europe and tank commodities, especially agriculture. “What happened after the failure of the Hoover campaign of optimism makes sad reading. Commodity prices plunged to shocking depths. Wheat, for instance: during the last few days of 1929, December wheat had brought $1.35 at Chicago; a year later it brought only 76 cents. July wheat fell during the same interval from $1.37 to 61 cents. Mr. Legge's Federal Farm Board was not unmindful of the distress throughout the wheat belt caused by this frightful decline; having been empowered by law to undertake the task of "preventing and controlling surpluses in any agricultural commodity," it tried to stabilize prices by buying wheat during the most discouraging stages of the collapse. But it succeeded chiefly in accumulating surpluses; for it came into conflict with a law older than the Agricultural Marketing Act-the law of supply and demand. When the dust cleared away the Farm Board had upward of two hundred million bushels of wheat on its hands, yet prices had nevertheless fallen all the way to the cellar; and although Mr. Legge's successor claimed that the Board's purchases had saved from failure hundreds of banks which had loaned money on the wheat crop, that was scant comfort to the agonized farmers. A terrific drought during the summer of 1930 intensified the prostration of many communities. Once more the farm population seemed pursued by a malignant fate. They had benefited little from Coolidge Prosperity, and now they were the worst sufferers of all from the nightmare of 1930-31.” – Only Yesterday: An Informal History of the 1920’s. Fredrick Lewis Allen, 1931. In September 2007’s report The Return of Capital, Not The Return on Capital we mentioned that banks were holding assets off their balance sheet in Enron-like entities. At the time, Citigroup had “no concerns.” Perhaps their opinion has changed. In the first quarter of this year, they were forced to bring $129B of these assets back on their balance sheet and write off $13B in losses. According to CFO.com, “As of Q4 2009, financial-services companies in the S&P 500 had stashed $5.5 trillion and $1.6 trillion, respectively, in variable-interest entities (VIEs) and the now-defunct qualified special-purpose entities (QSPEs).” These losses will continue to reduce lending and provide more fuel for deflation.